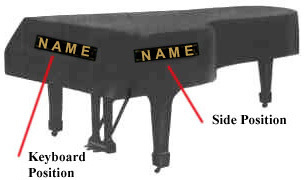 If you don't see your model number listed below, just measure the entire length of your piano, from in front of the keys to the furthest point at the back curve. After Modern transported my Mason Hamlin A sized grand from a nice, air conditioned abode in North Carolina to the California Bay Area ( where the air conditioning consists of throwing the windows open) it became apparent that a cover was needed. An on-line search quickly lead me to Piano Showcase, and their vendor Vandaking. The order process is flawless, as is the cover! Very quick to ship too! 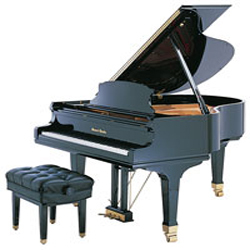 I ordered a piano cover for my Mason & Hamlin 1922 AA grand piano. It is really nice: soft and cushiony on both sides. Feels like it will last. Even though it is the stabndard length, the cover extends beautifully passed the keyboard, actually reaching to partially cover the bench as well. I am very happy with the qaulity and construction of my purchase. Thanks once again for a great purchase. Having just restored my 1925 Mason & Hamlin A, with 2 curious cats in the house, I was really wanting serious protection and have the cover on most all the time I wasn't playing it. I'm a picky person, and didn't want a big ugly thing in my living room. The cover with the split sides is perfect, looks totally pro, and provides great protection against the claws. I'm totally satisfied. We are extremely pleased with our Mason & Hamlin grand piano cover and seat cushion. The quality is excellent. We did order the string and action cover as well, but returned as it was too big. It was lovely, however ... just didn't fit. The customer service, regarding my initial purchasing questions and my return, was excellent. Highly recommend this company.